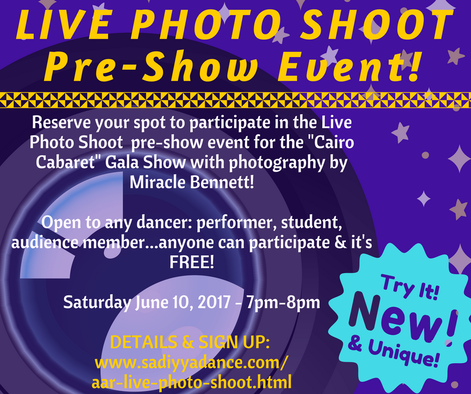 Reserve your spot to participate in a pre-show Live Photo Shoot with Miracle Bennett! Open to any dancer: performer, student, audience member...anyone can participate! Something new and unique! In the spirit of our Ahlam Al Raks 2017 themes, "Improvisational Dance" and "The Inner Workings of Preparing for a Performance," we have decided to organize a LIVE photo shoot on location at the Plano Dance Theatre Black Box! The photo shoot will be on stage as the audience comes in before the show. Each dancer gets five minutes on stage with the photographer. Recorded music will be playing and the dancers can choose to dance to it in order to get some motion shots and/or do still poses. It is limited to 5 dancers who sign up ahead of time and it is free for the dancers who sign up! After viewing the photos that Miracle shoots, dancers can opt to purchase any photos that they like. Miracle Bennett is the official photographer for the Pre-Show Live Photo Shoot Event. Book My Mini Photo Shoot! Register for the "Picture Perfect: How to Prepare for a Photo Shoot" Workshop HERE!